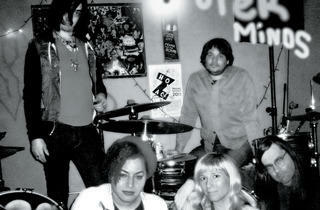 Throwback garage rockers Outer Minds rip it up like Wolverine in an Archie comic. 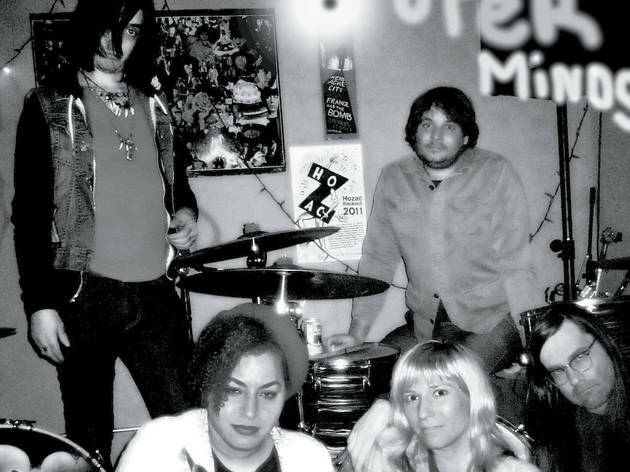 Like former labelmates and fellow Chicagoans Mickey, Outer Minds have that weird thing where when you first see them, they don’t look as if they should all be in the same band, maybe not even the same universe. Like Wolverine in an Archie comic. There’s a denim-clad wastoid, a soul singer in a vintage dress and a blond with bangs. But unlike Mickey, or the openers of this gig, Mannequin Men, Outer Minds are not interested in challenging garage rock expectations, sonically. They are about capturing the 1960s Nuggets, 60-year-old-with-a-pageboy-haircut-record-dealer vibe sublimely. Going beyond the space-time boundaries of Zach Medearis and A-Ron Orlowski’s former neogarage band Lover!, this fuzz-pop-psych outfit doesn’t merely genuflect at the altar of ’60s Sunset Strip jangle; it sounds like it really is an act from the Sunset Strip of the 1960s. On its new self-titled, full-length debut, the release of which this concert celebrates, the fivesome sells it even better by making its buzzing throwback organ, garage-punk thump, dreamy-nightmarish guitar and hair-raising harmonies sound as if they’re crackling out of old, low-end speakers. If they were in an Archie comic, these X-Men would wipe Josie and the Archies off the school-dance circuit.